Marketers spend millions on establishing their brands and want to know what's driving campaign return-on-investment (ROI). That's where third-party companies like Nielsen come in -- to connect the dots with data. In an ROI study of 500 advertising campaigns, Nielsen looked at which elements contribute to sales on all major media platforms. By a huge margin, creative was the strongest sales driver. It was responsible for nearly 50% of all sales lift. Knowing this, Suzanne Grimes, Executive Vice President Marketing, Cumulus Media and President of Westwood One, has made understanding effective audio creative a core value of our company. "We want to know what makes creative resonate, specifically from a data perspective, and turn our learnings into best practices that advertisers can use as actionable steps for optimizing their ads," she says. 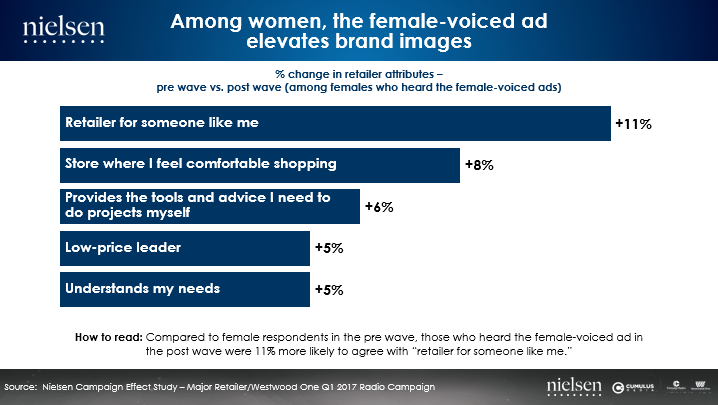 In one of our studies of how to best leverage audio to drive ROI, Westwood One commissioned four separate studies of 284 radio ads that prove women should have more of a starring role in audio creative. The results show there is much to gain in putting more women on the air, yet most AM/FM radio and TV ads have a male voiceover. Using Media Monitors, we examined the gender voices used on an average day in a sample of the 100 top AM/FM radio advertisers for October 11, 2018. Selecting one random ad from each advertiser, we found men voiced 72% of the spots, and only 28% were voiced by women. There seems to be a disconnect between what advertisers know and what they practice about spending. An IPG study recently found that women impact over 90% of purchases for vacations, new homes, food and grocery and medications. They impact 80% of all healthcare purchases and two-thirds of computer and auto purchases. Women have immense spending power but are underrepresented in ad creative. And, says MediaVillage columnist and renowned advertising journalist Stuart Elliott, "It just makes sense to embrace all voices -- from regional accents to trust in female spokespersons -- to add authenticity to spots. Given today's environment the importance of brands communicating diversity and inclusion even through their creative is more important than ever." 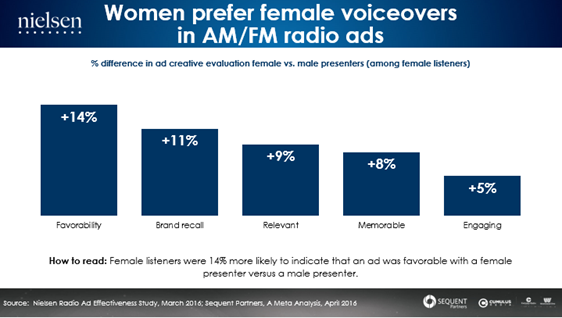 Women in fact prefer female voiceovers in AM/FM radio ads. Westwood One worked with well-respected brand and media metrics consultancy, Sequent Partners, to analyze nearly 100 AM/FM radio ads tested by Nielsen. Alice Sylvester, the co-founder of Sequent Partners, coded each ad as having either a female or male presenter and examined creative performance by gender in the Nielsen data. Sylvester's breakthrough discovery was that women rated female-voiced ads better for favorability, brand recall, relevance, memorability and engagement than male-voiced creative. Women preferred hearing voices like their own on the radio. The Advertising Benchmark Index (ABX) confirms this finding with their own 2018 study of 115 AM/FM radio ads. The results showed that both men and women preferred female voices in radio creative. 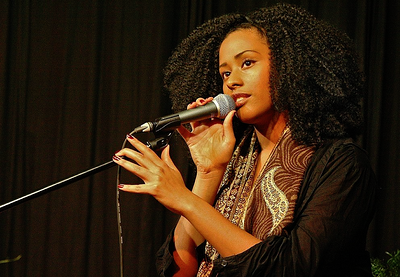 Women responded more favorably to female voices by 14%. It's not just women either -- men responded more favorably to the female-voiced radio ads by 5%, too. Female-voiced ads drive greater consumer response than the same ads voiced by a man. Thanks to the findings from Sequent Partners, a major retailer wanted to conduct a real-world study to determine whether female voiceovers would work for them. In one set of markets, listeners were exposed to a female-voiced version of the ad. In other markets, listeners heard the same ad voiced by a male. The female-voiced ad strongly boosted unaided awareness. Nielsen found significant lift in brand awareness among both men and women exposed to the female-voiced ad. But among women, the female-voiced ad elevated brand images more. Auto intenders rate female-voiced ads the best. A recent national study by audio creative testing specialist Veritonic found auto dealer association AM/FM radio ads voiced by women were some of the best testing creative among both men and women. While only a few of the ads tested used a female voice in a primary role, those ads performed off the charts. Two of the top five ads contained a leading female speaker. Three of the top ten ads had a female speaker with a leading role. That's a compelling reason for auto advertisers to rethink who they cast in commercials. Female-voiced ads score better for being authentic, trustworthy and unique. According to another new study conducted by Veritonic of radio ads from the most prestigious advertising and creative award shows including the Radio Mercury Awards winners and finalists as well as the Cannes Lions and Clio Awards, female-voiced ads performed better on the dimensions of authenticity, trust and uniqueness. This is hard evidence to support far greater use of female voiceovers. The Advertising Research Foundation, Nielsen, Analytic Partners and most market mix modelers all agree advertising creative is the most significant driver of sales. Creative drives more sales than all media factors combined. While so many in advertising obsess over data-driven targeting, the ROI studies reveal that powerful and strong creative is by far the biggest driver of sales growth, and it's not going unnoticed. "It's well known that women are under-represented in the production of creative advertising," says ANA (Association of National Advertisers) Chief Executive Officer Bob Liodice. "That's why the ANA created the #SeeHer initiative, which is designed to accurately portray all girls and women in media so that by 2020, they see themselves reflected as they truly are. And now Westwood One has made a significant contribution to the work being done in this area with important new research revealing that women prefer hearing voices like their own on the radio. The ANA applauds their efforts." Creative is powerful. Creative voiced by women is even more powerful. Armed with conclusive findings on the significant impact of female creative, it's time for advertisers to leverage the female voice as a strong and powerful solution to connect with audiences and drive sales. Pierre Bouvard is Chief Insights Officer for Cumulus Media and Westwood One. Pierre works with brands and agencies to craft targeting and measurement solutions. For more on Pierre, read here. ABX provides ad effectiveness scores from human respondents against 14 variables and in all media types. ABX Index values are a comparison of the results of an ad versus the average of all ads in the ABX database (145,000+ ads). Click for more information about definitions and methodology. Where else can you get free ad effectiveness data for your competitors? ABX is also offering an e-book, “Four Key Performance Indicators to Decrease Advertising Investment Risk & Build ROI," which shares insights gained from the world’s largest database of bench-marked ads. With this e-book, you will learn the characteristics of powerful ads and how your ads can be more successful in driving results.